3 Bedroom For Sale in Close Lane for Guide Price £234,950. 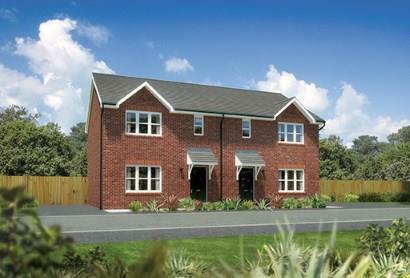 The Caplewood is an elegant semi-detached family home with three bedrooms. The entrance hall leads directly to a light and airy living room which continues in to a generous kitchen/dining room with high quality integrated appliances and French doors offering access to the back garden. There is also a convenient downstairs cloakroom and useful laundry zone, plumbed and wired for your laundry equipment. The first floor features a spacious master bedroom with a luxurious en-suite and walk-in wardrobe. Across the landing is a second bedroom with a built-in wardrobe, a third bedroom and a good-sized family bathroom with fitted vanity furniture. A detached garage completes the benefits that this smart home has to offer.